From the beginning, the goal of cbdMD has been to produce the industry’s highest-quality CBD products by using the most state-of-the-art growing and extraction methods. This means that cbdMD is using the highest-quality hemp combined with the industry’s latest extraction techniques to bring you not only a product that does what it’s intended to do, but also one you can trust. Before cbdMD planted their roots in the CBD industry, they wanted to make sure they were doing it right. This is why they visited 3 continents, explored 14 countries, and 8 different states in the US before deciding to source their CBD from hemp grown in the nutrient-rich soil of Kentucky, a state that actually has an extensive history of hemp cultivation. One thing cbdMD is adamant about is their commitment to quality. They understand that not all hemp is created equal…and therefore, not every CBD product is of parallel quality. Hemp is a plant that absorbs toxins present in the soil its cultivated in (a bioaccumulator). This is a process known as phytoremediation, something hemp plants are so adept at that hemp was planted in abundance around the Chernobyl nuclear disaster site in attempt to remove radiation from the soil. Hemp is also something that is largely unregulated…which means that hemp grown overseas (think China and Europe) could have been grown in less than ideal conditions. Sure, it might be cheaper to source CBD oil extracted from hemp grown in other countries, but it’s difficult (if not impossible) to determine the conditions in which the plant was grown. The commitment to quality cbdMD prides themselves on has led them to win awards over the past few years. And as a company that’s totally transparent, they invite you to read reviews and testimonials about their products that are posted by consumers and professionals alike. At CBD School, we’re adamant about test results on CBD products. Why is third-party testing so important? Because all hemp is not created equal. In such an unregulated market, anyone can offer a CBD oil and say it’s the best. If it weren’t for third-party test results, nobody would know the difference. Not exactly fair to the consumer, if you ask us. cbdMD gets this. And that’s why all the products they offer go through rigorous testing through the entire extraction and purification process. cbdMD’s testing doesn’t stop there. Products are sent to an independent, third-party lab where they undergo additional testing to ensure that each product they offer isn’t only of the highest-quality, but so that it’s safe for you, the consumer. They take pride in being fully transparent with the products they offer. Want to know what’s in your cbdMD product? They’ve made it easy to view third-party lab results on their website, something you can do now by clicking here. Something you might not know about us here at CBD School…we’re huge fans of taking baths. In fact, we take baths on a regular basis (and would honestly take one everyday if we could). While we don’t always have the time to indulge into a self-care routine like we’d like, when we do take our beloved baths, you can bet we’re dropping a bath bomb in there. What’s so special about a bath bomb? For one, they’re great for your skin. Made with ingredients to leave your skin smooth and supple, bath bombs are a great way to pamper your skin and can seriously add to the whole bathing experience. For another, bath bombs serve a bigger purpose than just adding a bit of luxury to your tub. Bath bombs are typically made with different scents, each serving their own aromatherapy purpose. Need to relax at the end of a long day? A bath bomb with a soothing, calming scent like lavender would be perfect. On the other hand, if you’re taking a morning bath (which we highly recommend) and need a bit of energy to start your day, going with a scent know to elicit energy (like orange or eucalyptus) can offer the extra boost you might need. If there’s anything we like more than a bath bomb, it’s a bath bomb infused with CBD. Let’s just say we couldn’t wait to get our hands on cbdMD’s line of bath bombs. With a line of six different bath bombs made from organic CBD and high-quality, pure essential oils, there’s an option to fit almost everyone’s needs. And priced at just $9.95 each, they’re an affordable CBD option that won’t break the bank. Each bath bomb cbdMD offers contains 100 mg of pure CBD and made without any artificial dyes or preservatives. They maintain their coloring is all-natural, however, the last ingredient in their bath bombs is “food coloring.” We’re not sure if they use natural food coloring sources or not, but this is something to keep in mind if you’re sensitive to food coloring in general. Bath bombs are also available in multipacks…two options of 3-packs for $23.95 and a 6-pack sample option of all formulations for $39.95. The first time we tried cbdMD bath bombs was after a long road trip. Needless to say, we needed to relax in the biggest way possible. We went straight for the “Relax” option and relax we did indeed. The lavender scent combined with the CBD oil, Epsom salts, and other ingredients offered exactly what we needed to relax after days on the road. As far as CBD bath bombs are concerned (of which we’ve tried a few), these offered exactly the relief we were looking for. We also tried their “Romance” option, not necessarily because we wanted to get in the mood, but because we love Frankincense. It’s a highly beneficial essential oil that is known reduce stress, promote emotional regulation (think ease depression), contain anti-proliferative effects (inhibit cell growth on tumors), have antibacterial effects, heal skin, prevent the signs of aging, and more. 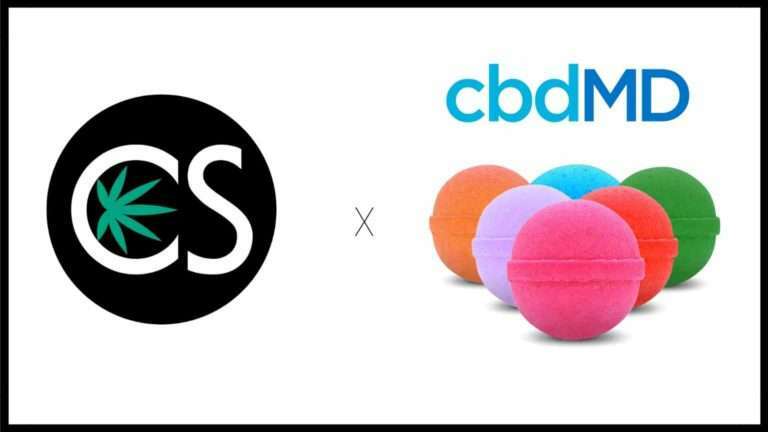 So how did cbdMD’s Romance CBD Bath Bomb treat us? Exactly like we hoped it would. The smell is amazing, and we felt even more amazing after 30 minutes of soaking in our “CBD tub”. With 100mg of CBD in each bath bomb, we know we’re getting what it takes to make us feel our best. They also dissolve quickly, smell amazing, and won’t stain your tub like some other bath bombs on the market. Enjoy baths as much as we do? Do yourself a favor and pick up a couple of cbdMD’s bath bombs. You’re bound to enjoy your bathing experience even more. We know we did. Now excuse us while we go run a tub.